Veteran Cristie Kerr set a US Solheim Cup record with her 19th career point when she teamed with Lexi Thompson for a 5 & 3 fourball victory over England's Jodi Ewart Shadoff and Germany's Caroline Masson. US captain Juli Inkster held the previous US record with 18 1/2 points. Kerr finished the day with 20 career points as she and Thompson teamed up again to beat Scotland's Catriona Matthew and England's Georgia Hall 4 & 2 in fourball play. Kerr's birdies at the first and third put the US duo 2 up before Hall's eagle at the par-five fourth trimmed the deficit. But the European pair never managed to get ahead, and Kerr and Thompson were 2 up through 14 when Kerr holed out from a bunker for eagle at the 15th to put the Americans on the brink of victory. "She was an animal out there," Thompson said of Kerr after the match concluded at the 16th -- where Matthew's long putt to extend the contest came up inches short. "We just knew they were going to play really tough, and they did," Kerr said. "They made a lot of birdies, they stuffed it on some holes that I had to make putts on top of them -- Lexi had to make putts on top of them." A strong display from England's Mel Reid and Spain's Carlota Ciganda also proved fruitless as Americans Brittany Lincicome and Brittany Lang emerged with a 2 up triumph. Lincicome started with six straight birdies and made 10 in the first 15 holes. Lang holed a wedge for eagle on the seventh hole as they vanquished a European pair that were 10-under. European captain Annika Sorenstam said she could only congratulate the Americans on "some amazing golf". "We had 35 birdies and one eagle and lost three matches," she said. "It's easy to just kind of throw in your towel but they didn't. They kept fighting back and fighting back, getting it to 1 down. "So very, very proud of them. But you know it just wasn't enough. It's just sometimes you just get beaten by good golf. And that happened today. So they were on fire. All I can think of is I hope that fire is contagious and that we're on fire tomorrow." England's Jodi Ewart Shadoff and Sweden's Anna Nordqvist delivered the only afternoon win for Europe, defeating Lizette Salas and Angel Yin 4 & 2. In another close one, Americans Paula Creamer and Austin Ernst collected their second win of the day, 2 & 1 over France's Karine Icher and Sweden's Madelene Sagstrom. Creamer and Ernst had beaten Reid and Dane Emily Pedersen 5 & 3 in foursomes play, with Reid and Pedersen undone by four straight bogeys on the back nine. Europe, missing England's Charley Hull who aggravated a wrist injury on Friday, rallied from early deficits to win two foursomes matches. Nordqvist and Hall beat Lewis and Piller 2 & 1, while Matthew and Icher notched a 2 & 1 win over Danielle Kang and Michelle Wie. Hull is poised to tee it up on Sunday, when Europe will attempt an unprecedented comeback. 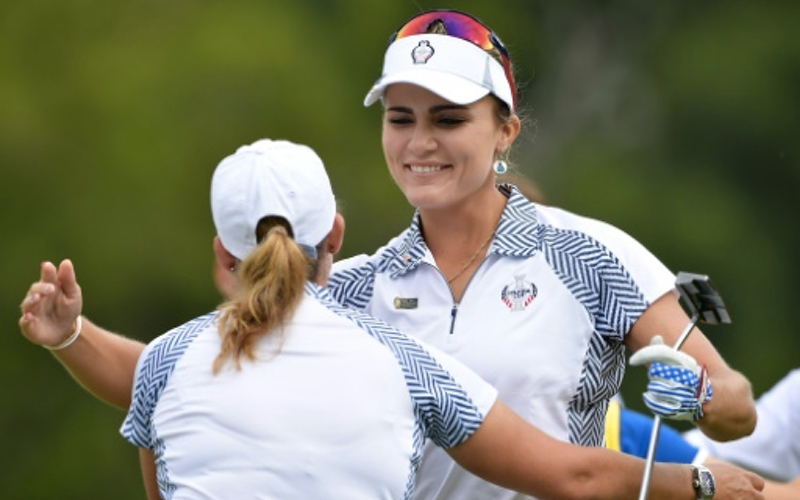 The Americans rallied from a 10-6 deficit on the final day two years ago, but no Solheim Cup or Ryder Cup team has come back from more than four points down on the final day to win. "We saw what happened in '15," Nordqvist said. "If there are matches left, there's still a chance."